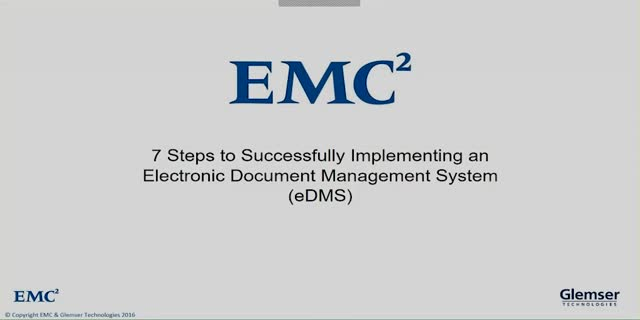 Watch and discover the five essential best practices for implementing an electronic document management system for Life Sciences organizations. Watch this Webcast and explore the challenges and expectations of General Data Protection Regulation to ensure compliance. The new European data protection (GDPR) legislation will enter into force in 2018, to shape the EUs future data protection framework. GDPR introduces many new aspects for organisations to be prepared and look after, as accountability obligations on data controllers to demonstrate compliance, and ‘privacy by design’. The GDPR has an expanded territorial reach and catches also data controllers and processors outside the EU. Learn more about GDPR requirements from Prof. Ingrid De Poorter from University of Ghent and how technology can support your organisation to get ready and compliant. Watch this Dell EMC and IDC Webcast, and explore integrated care readiness and how to sustain better decision making on care pathways as IDC shares results from its recent Health insights research. Learn more about the readiness of integrated care, the priorities of clinical and IT executives, the barriers still preventing having care truly centered around the patient. IDC health insights reports on the details of a research conducted in the UK and Nordics, measuring the maturity of adoption of strategies, governance and architectures able to sustain better decision making on care pathways. The webinar also includes a zoom into mental health integrated practices and directions, and addresses some of the most common mistakes and misconceptions on improving patient information management, including analyst's guidance for hospital, primary care and secondary care executives. Watch this Dell EMC Webcast and explore the true meaning of digital transformation. With all the talk about “digital transformation,” some are left to wonder: what does digital transformation really mean? As organizations strive to become digital enterprises, it is important to understand what this encompasses in order to implement the appropriate strategies to become a truly digital organization. Watch this CEB and DELL EMC Webcast, and learn how digital content management is helping financial institutions respond to digital transformation. Watch and discover how Documentum Electronic Trial Master File (eTMF) can help navigate the complex clinical trial path and provide more granular eTMF plannin, better quality and actionable insight. Watch this webcast and hear Adam Kelch, Senior Product Manager, Documentum Clinical Solutions, provide an overview of the key enhancements of Documentum eTMF announced at EMC World in Las Vegas in May. He’ll also discuss how our latest release (4.2) delivers more granular eTMF planning, better quality and actionable insight. Watch and learn how Documentum Research and Development (R&D) and Documentum Submission, Store and View (SSV) ensures alignment with global regulatory guidance to speed submissions. Listen as Lena Shafir, Product Manager, Life Sciences Regulatory Solutions, provides an overview of recent enhancements to Documentum Research and Development (R&D) and Documentum Store and View (SSV). She’ll also cover how our latest release (4.2) delivers lifecycle support for medical device documentation and ensures alignment with global regulatory guidance to speed submissions. Join the Webcast and learn how the latest enhancements of Documentum Q&M can deliver lifecycle support for medical device documentation - from design to production manufacturing, while ensuring compliance. Hear Jessica Kelley, Quality Product Manager, provide an overview of the key enhancements and integrations with Documentum Q&M announced at EMC World in Las Vegas in May. She’ll also explain how our latest release (4.2) delivers lifecycle support for medical device documentation from design to production manufacturing and provides flexible print controls to maximize efficiency while ensuring compliance. Watch this EMC webcast and learn how solutions and cloud technologies can help improve capital projects performance and simplify project document sharing and transmittals. Managing capital projects requires addressing many complex challenges at the same time. At every phase of a project, documents need to be managed and shared across large project teams, inside and beyond the organization. During this webcast, we will explore how customers are leveraging solutions to manage documents and enable collaboration across distributed teams. We will highlight real-world examples of companies that are deploying cloud technologies to take control of their projects and simplify sharing project documents and transmittals. Watch this EMC webcast and discover how Clinical Research Information Platform is a key aspect in making all patient information available to researchers and clinicians. Learn how a resilient Clinical Research Information Platform is a key aspect in making all patient information available to researchers and clinicians. Better leveraging the insights coming from new data as genomics and through a wider use of big data and analytics, the platform helps improving clinical trials outcomes making personalized medicine affordable and effective at scale. IDC Health Insights EMEA Senior Research Manager Silvia Piai and Michael Graetz, VP of Healthcare Sales EMEA at EMC will discuss about a recent European study on the needs and opportunities of convergence between Healthcare institutions, Research Centers and life science organization. Watch and learn how EMC is helping companies increase operational efficiency and achieving real business value. Attend this EMC webcast and explore key strategies to managing and providing access to critical asset information during the Big Crew Change. In today’s Energy industry, the workforce is undergoing tremendous change, as all sectors are facing the wave of employees retiring as part of the Big Crew Change. In the Oil & Gas industry, shakeups in the wake of lower oil prices have seen thousands of employees leaving companies. With the large exodus of subject matter expertise, managing and providing access to your asset information is more important than ever. During this webcast, we will explore the key strategies that ensure that you are able to survive without your most seasoned employees and are positioned to onboard new, less experienced employees in the future. Documentum industry solutions built for its unique challenges. Industry solutions are built on the Documentum platform to address the unique challenges faced in each. Documentum for Life Sciences solutions breaks down information silos to transform how organizations access, manage and share regulated content. Documentum Healthcare Solutions support connecting people and processes at the point of care, facilitating collaboration, information sharing and management within and beyond hospital boundaries. Documentum Energy and Engineering solutions help organizations that design, construct, operate, and maintain large plants and facilities to optimize engineering and construction projects, and improve plant operation and maintenance.